Thirsty Pilgrim: At That Price You Can't Afford NOT to Drink It. Read it and weep. 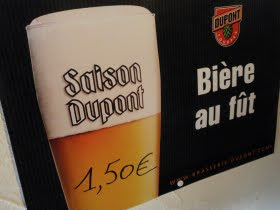 One and a half eurobucks for a glass of Saison Dupont, fresh on tap. What's a short bottle of that stuff going for in New York these days? That poster is on the wall of the Caves Dupont, the pub just across the road from the brewery in Tourpes. Keep an eye out for this and more in an upcoming issue of DRAFT, featuring a piece on something we call Saison Road. Should be useful for anyone considering, planning or even just fantasizing about a tour of Belgium's farmhouse breweries. A compelling reason to drink local beer.